Coaches of athletic teams have fully embraced the “next man up” concept. So have we when it comes to celebrations and festivals. We follow the path for different reasons than coaches. They do it when someone is not capable of playing further. We do it not to miss any of the fun. When we finish the Christmas and New Year’s seasons, we roll right into Carnival and then cap it off with one of the greatest celebrations on the planet, Mardi Gras. But Mardi Gras was so yesterday. Now what are we doing to do? People not from here do not believe this but we stage one of the great St. Patrick’s Day festivals anywhere. While our community is associated with the French and the Spanish, our ancestors welcomed immigrants from everywhere. The Irish were prominent among new citizens in search of a better home. The fact that they were usually strong and worked cheaply also added to the Irish assimilation into New Orleans culture. Like most ethnic groups in large American cities, the Irish concentrated their living arrangements in a particular area of town. Here there was a heavy Celtic population base in an area still known as the Irish Channel. Churches, grocery stores and other essential services were aimed at the Irish lifestyle. Interestingly, just across Constance Street was a part of town focused on Germans. St. Alphonsus and St. Mary’s Assumption Catholic Churches were literally across the street from each other with Irish and German parishioners never attending the other’s ceremonies or mass. While it would be reasonable to imagine the residents of Dublin celebrating their country’s patron saint’s Feast Day, it is not so. The real St. Patrick’s Day celebrations occur mainly in America, in cities like New York, Chicago, Philadelphia and New Orleans, where Irish ex-patriot populations settled after fleeing Ireland for a hoped-for better life. Sometimes the dream was realized, and sometimes not so much. In any case, New Orleans does not need much history or provocation to celebrate every groups’ special days, and the Irish, in particular, are no exception. Multiple parades and celebrations will be happening in every section of the metropolitan area. Join in. Here are a few beverage suggestions to loosen you up and put you in the proper mood. You do not have to possess even a drop of Irish heritage to enjoy. Preheat a clear-stemmed glass with very hot water. Add the sugar and brewed coffee and stir well. 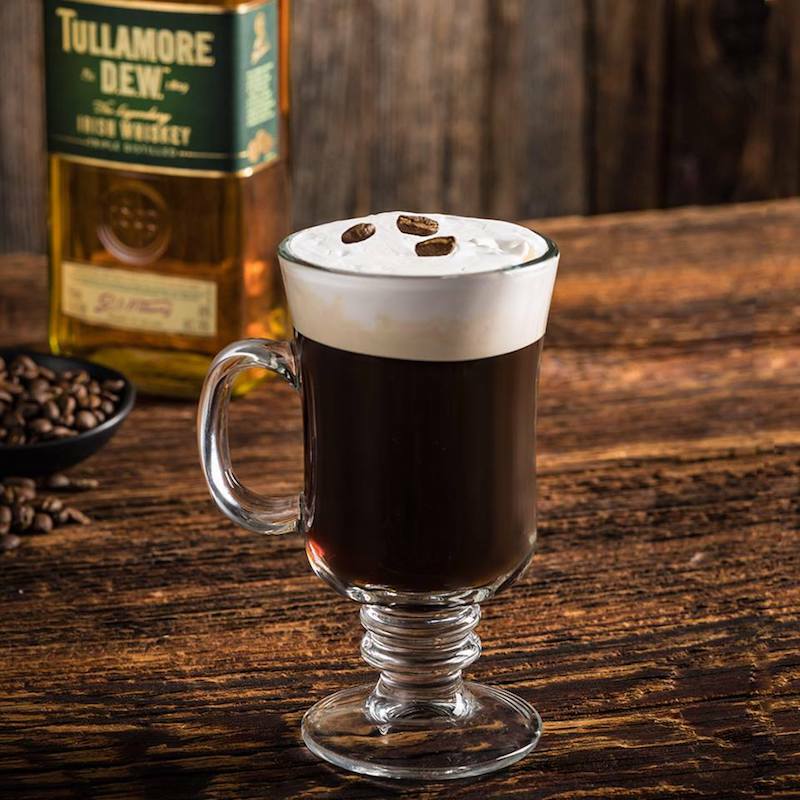 Once sugar has melted, stir in the Tullamore D.E.W. Irish Whiskey. Gently whip the heavy cream by shaking it in a protein shaker with a blender ball – you want a still somewhat loose, not stiff consistency. Pour the cream over the back of a hot teaspoon to top the drink (and prevent cream from penetrating the top of the drink). Finally, garnish with grated nutmeg or cinnamon for spicy finish. Combine whiskey and espresso in a small bowl; let stand 15 minutes. Strain whiskey through a coffee filter into a cocktail shaker. Meanwhile, stir sugar and 2 tsp. hot water in a small bowl until sugar is dissolved. Add demerara syrup and cold brew to cocktail shaker; fill with ice. Shake until outside of shaker is frosty, about 30 seconds. Strain into a Collins glass filled with ice and top with cream. Muddle the cucumber slices in a shaker. Add the remaining ingredients and ice to the shaker and shake vigorously. Fine-strain into a chilled rocks glass over ice. First warm a mug with hot water, then discard water and combine ingredients above. Stir before serving, garnish with lemon. All defined/created by Tim Herlihy, National Tullamore D.E.W. Ambassador. Thank you, Tim.